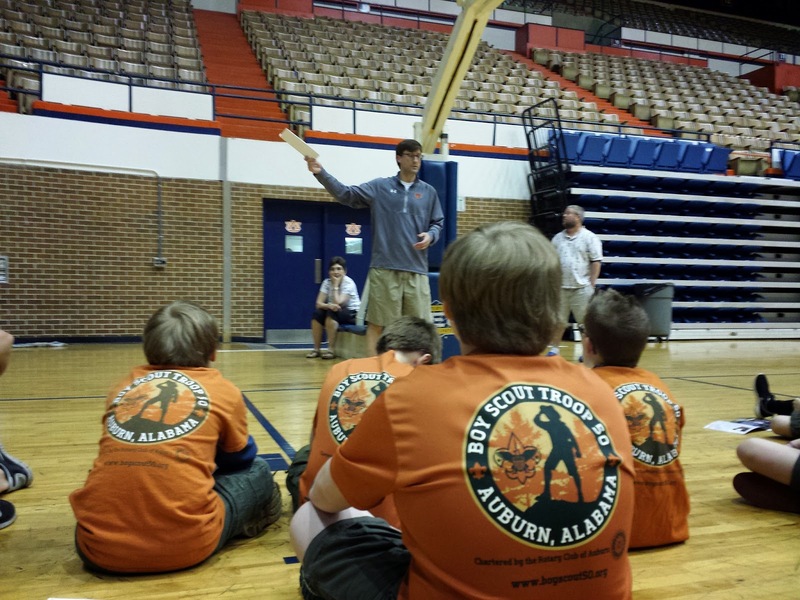 The troop deviated from its usual First Presbyterian Church meeting location to go courtside at Beard-Eaves-Memorial Coliseum Monday evening for a Disability Awareness Merit Badge session. Nathan Waters, a disability specialist in Auburn University's Office of Accessibility, shared with Scouts about disability etiquette and the accommodations and support services that are available to university students and faculty through his office. Following the discussion, Jared Rehm, an adaptive sports and recreation specialist in the Office of Accessibility who coordinates Auburn's Adaptive Recreation and Athletics program, shared about his own physical disability, spina bifida. Jared, a veteran wheelchair basketball and tennis athlete, is also a member of Auburn's Wheelchair Basketball Team and the first student to represent Auburn in wheelchair tennis. Jared and Nathan have worked together on behalf of adaptive sports since 2009 when they established the campus organization Adaptive Recreation and Athletics to provide recreational opportunities for students, faculty and staff who have disabilities. 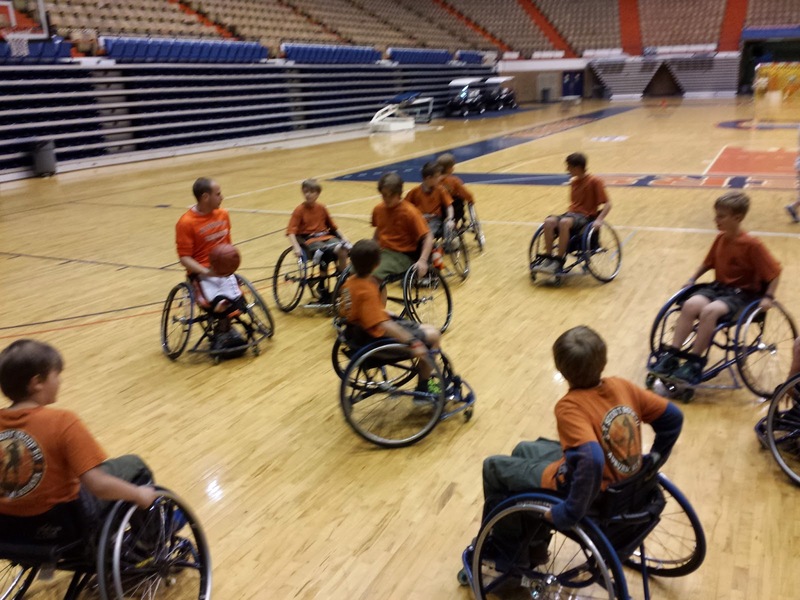 When the two met met in the Office of Accessibility, they also combined efforts to start the Auburn University Wheelchair Basketball Team with the support of the Department of Kinesiology and the Office of Accessibility. Jared shared with Scouts that he considers his wheelchair to be part of his sports equipment just as football players suit up with pads and a helmet. He discussed the differing features between the wheelchairs he uses to compete in basketball and tennis, as well as the modifications made to his car that allow him to drive. Scouts spent the remainder of the session trying their skills at playing wheelchair basketball as well as driving some of the handcycles on hand. 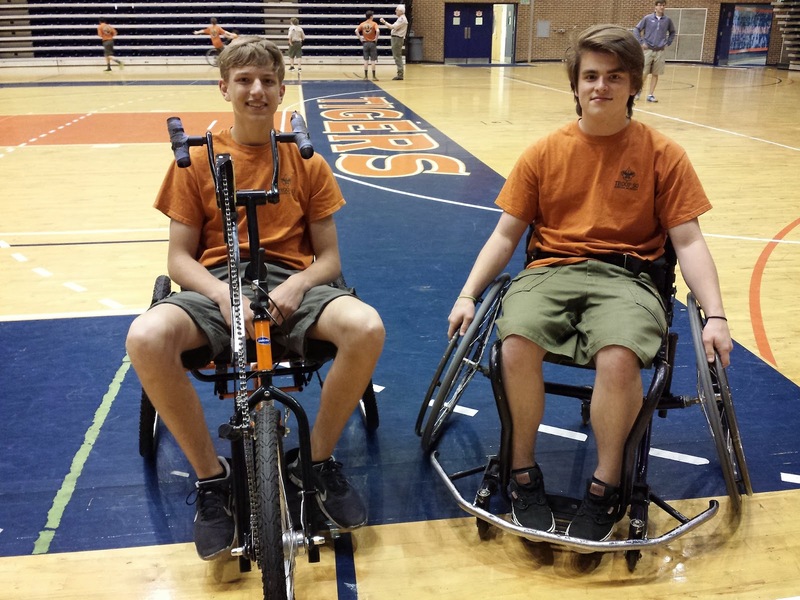 Check out the video below from our Scouts and leaders' first foray into playing wheelchair basketball, and visit our online photo album for additional photos from our merit badge session.